Attention! 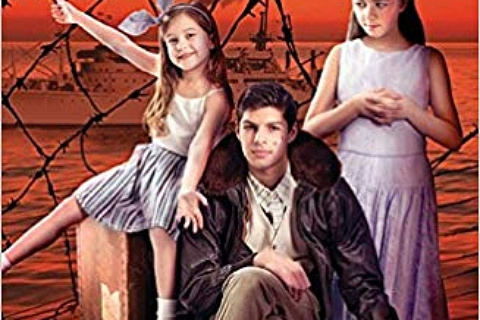 Calling all young readers! Are you an adventurous middle grade reader (ages 8 to 11) who would love to travel throughout the middle ages? Do you find medieval battles thrilling? Do you want to fight for justice? 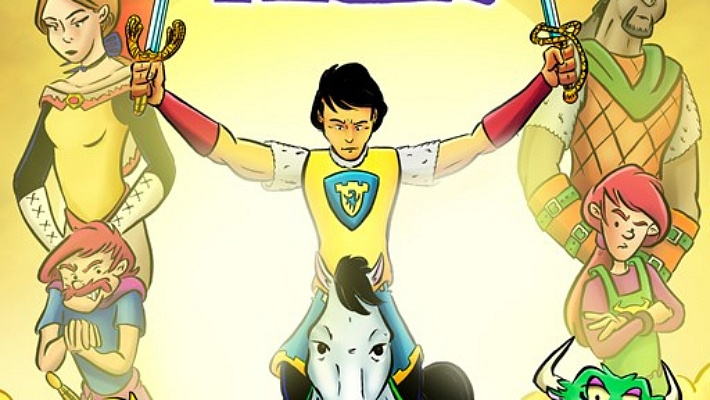 If so Alexis Fajardo’s graphic novel Kid Beowulf: The Rise of El Cid might be perfect for you. 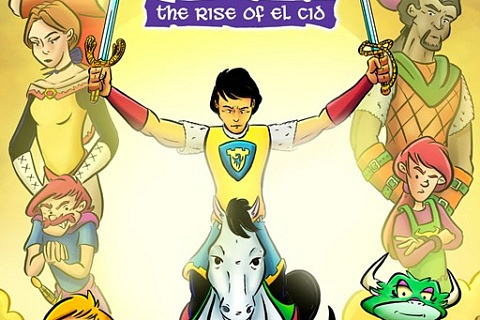 The Rise of El Cid is the third comic book in the Kid Beowulf trilogy. It begins with a captivating prologue about the well accomplished warrior, Rodrigo, who became nicknamed “El Cid,” because he won so many battles. The prologue is beautifully hand inked, watercolored, and written in the format of a poem, but from the start of chapter one, the graphic novel is digitally colored, and written in prose. The Rise of El Cid takes place in many different parts of Spain, as it shows different characters’ journeys around the country. Each of the sub-plots has different characters who display different temperaments and goals (some good, others evil). All of the characters are in some sort of trouble: some are lost, others are in danger of being murdered. Although the graphic novel includes lots of battle scenes, it has some humorous ones, too. For instance, one of the Ibn Al-Fajar has a pet lion who provides comic relief, by giving people such a shock that they jump into each other’s arms. One of these sub-plots focuses on Beowulf, an adventurous boy who travels with two loyal companions, his brother, Grendel, and friend, Hama (a piglet, whom I love dearly.) After a battle between two (unknown) groups of people, Beowulf gets into a fight with a warrior. They begin to tumble down a mountain and off a cliff. Grendel and Hama try to come to Beowulf’s rescue, but in the commotion they, too, fall off the cliff. The three travelers are lost, and very far away from where they started. While attempting to navigate their way home, Beowulf, Grendel, and Hama and run into serious trouble. 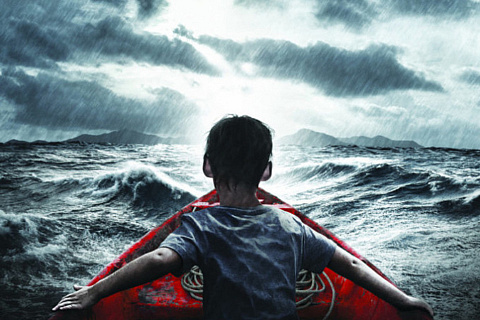 Will they be able to safely return to the High Pyrenees? Of the many characters in The Rise of El Cid, I found that Beowulf and I have lots in common. He wants the best for himself and his peers, but at times can be bossy and stubborn. For instance, Beowulf refuses to take Grendel’s advice. This provokes a big argument that could possibly be deadly. Will Beowulf and Grendel ever forgive each other? Will Beowulf or Grendel murder each other due to their strong rage? When Beowulf behaves this way, he reminds me of myself. Occasionally, when my parents and friends try to give me advice, I am too stubborn to take it, but later on realize I should have listened to them, because the situation I am in is terrible, due to the fact that I was unwilling to compromise, and too caught up in believing I was right. Rodrigo’s desire to stick up for justice, reminds me of activists today who had the courage to speak out, in opposition of the government, or people in power. For instance, Rodrigo, who lived in the middle ages, reminds me of a male version of Malala. I find Malala and Rodrigo very similar, because both of them had the courage to voice their opinion, even if it meant taking a life-threatening risk. The many characters and scenes in Kid Beowulf: The Rise of El Cid, remind me of current day events and people, for many reasons, some silly, others serious. If you want to know who lives, who dies, who loses friends, and who returns home, read The Rise of El Cid. 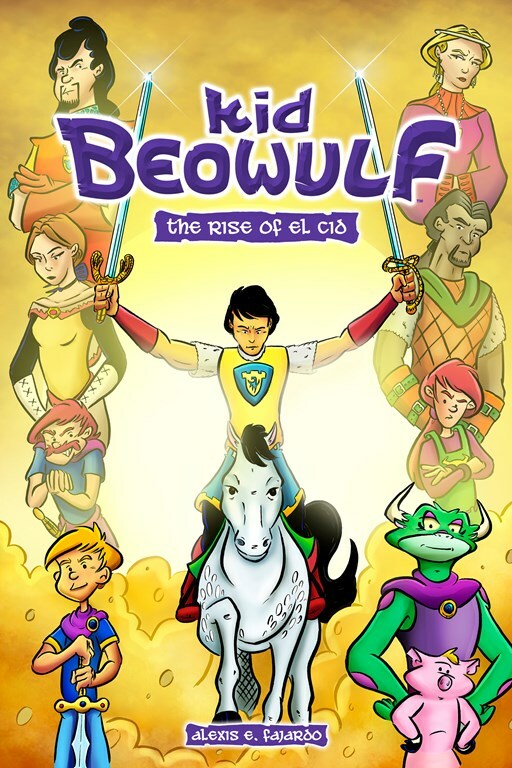 Kid Beowulf: The Rise of El Cid by Alexis E. Fajardo. Andrews McMeel Publishing, 2018. Buy the book here and support Stone Soup in the process!